World Map / Mali Map / Where is Mali ? Mali is an African nation, situated in West Africa. Mali is an African country, located in West Africa. Mali is bordered by Senegal and Mauritania to the west, Algeria on the north, Niger on the east, and Burkina Faso, Cote d'Ivoire, and Guinea to the south. Northern Mali is situated in the southern Sahara Desert and is a landlocked country. The coordinates of Mali are between latitudes of 10° and 25°N, and longitudes 13°W and 5°E. Mali has eight regions and one district. The capital of Mali is Bamako. Mali has an area of 1,240,192 square kilometers (478,839 square miles). The country was formed out of the three former West African Empires: the Ghana Empire, then Mali Empire, and then Songhai Empire. These empires were part of the trans-Saharan trade of gold and slaves. 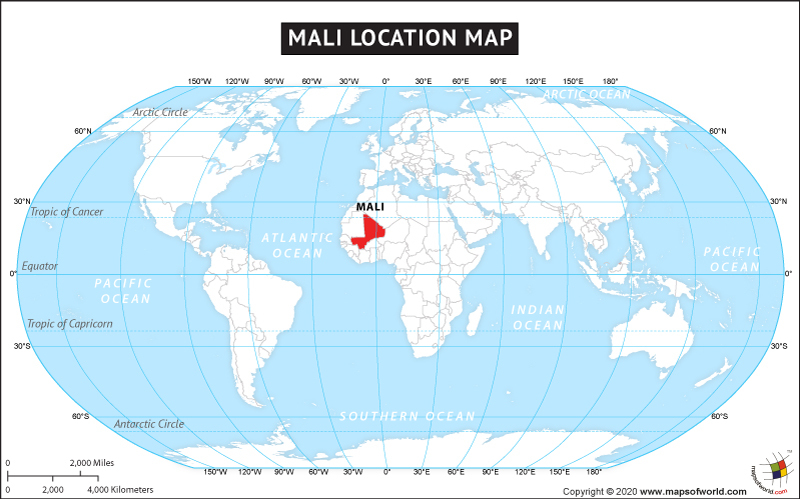 The country of Mali is in the Africa continent and the latitude and longitude for the country are 14.8128° N, 5.5030° W.